Defer Judgment – creative ideas come to mind all the time, we are just really good at swallowing them up in judgment very quickly. Write down anything that comes to mind. The time to judge, affirmatively, is during converging. Remember that judgement is the killer of creativity. Strive for Quantity – The first ideas that come to mind are not the most creative and won’t get you to the kinds of breakthrough you desire. Set a quota of way more ideas than you think you can get, 30, 50 or more. Keep pushing yourself to meet the stated quota and surpass it. The more the better. In order to get quality, you must start with quantity. 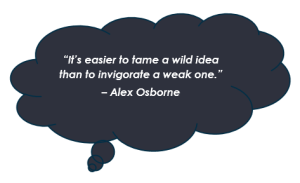 Seek Wild and Unusual Ideas – Stretch yourself to include ideas that at first seem crazy. Once you get thinking, if you are truly deferring judgment and striving for quantity, it’s likely some very unusual ideas will bubble up. Write them down. The wilder the ideas the better, you can always develop them later to be more realistic; however, you may realize you don’t even want to make them more realistic. DREAM BIG! Build on Other Ideas – Sometimes one idea can spark a whole series of similar, yet different, ideas. Write them all down. The goal is a lot of wild and unusual ideas so take every idea captive and make it confess all its accomplices! Behind every idea is a whole posse of valuable knockoffs.